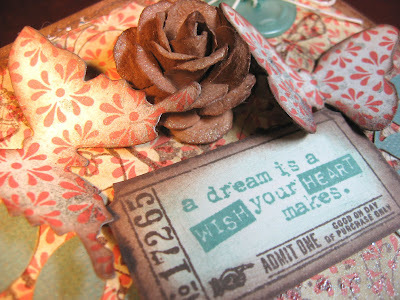 Have you visited Tim Holtz's blog today? He posted a photo there with all the birthday cards he received. I was thrilled to see mine in the lower right corner! How fun to be a part of his happy day! And, of course, he went to Disneyland. Such a kid. "Cindy" had asked me in the blog comments section where I got the vintage Mickey image for the inside of my card to Tim. I simply did a Google image search for "vintage Mickey Mouse" and found an image I liked at a good size, pulled it into PhotoShop Elements and screened it back to about 30% and printed it on Matte Photo Paper. Now on to today's post. I wanted to share a few simple altered items we made in my Cards & More Club last month. The idea was to use Close To My Heart's Elemental Paper Pack, the Art Philosophy Cricut cartridge, and some additional Tim Holtz goodness. 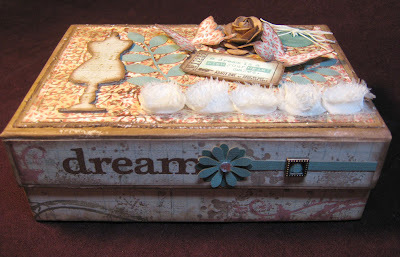 First up is decorative box made from Close To My Heart's My Creations® Card Box; a plain white, sturdy chipboard box with a strong double-magnetic closure. In addition to the Elemental Paper Pack (mostly on the top of the box) I incorporated some of the now-retired Notebook Paper Pack that I've had in my stash. It's definitely one of my all-time CTMH favorite paper lines with all the distressed grids, scripts, flourishes, coffee stains, and such. I covered the outer edges of the box and insides with this paper, adding a few more splatters from different stamp sets I have, and gave the whole thing a heavy dose of ink distressing with Chocolate ink on a dauber. 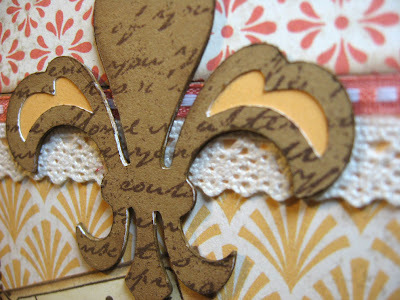 Those butterflies are from Tim Holtz's Alterations Movers & Shapers "Mini Butterflies" die. The tag stamp is from his Odds and Ends CMS100 set. 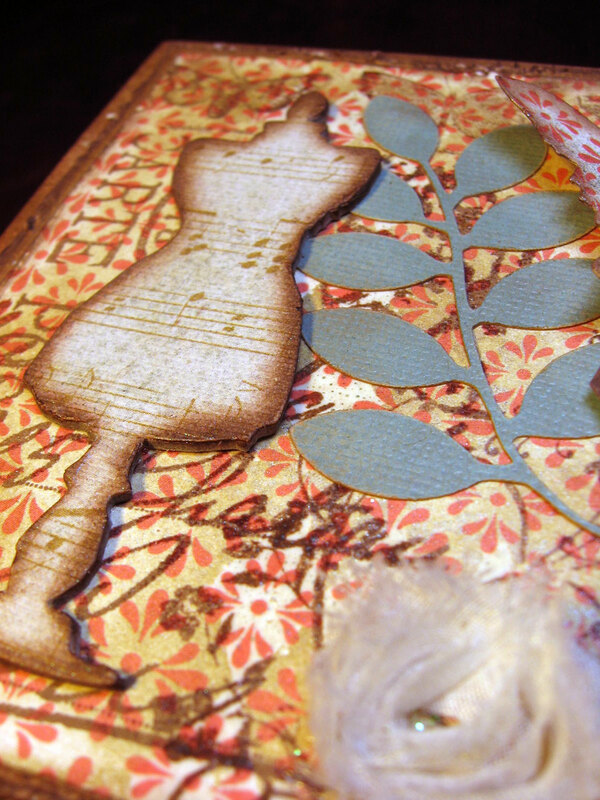 The dress form comes from Tim's "Mini Sewing Room" die and the leaf is from the Art Philosophy cartridge. 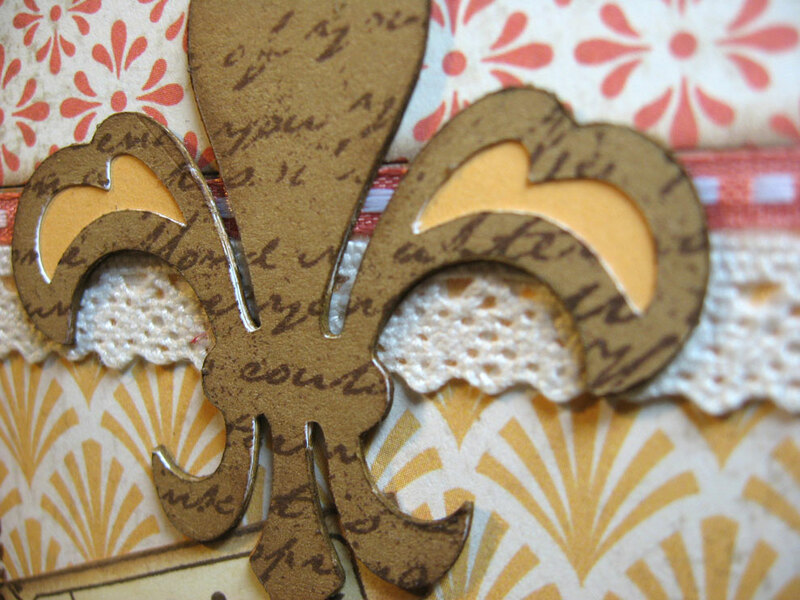 Hard to see the detail underneath, but there is a layer of script stamping ("French Market" set/Tim Holtz) with another layer of clear embossing using the diamond pattern in that same stamp set. A final spritz of Blue Patina Perfect Pearls mist finished it off. 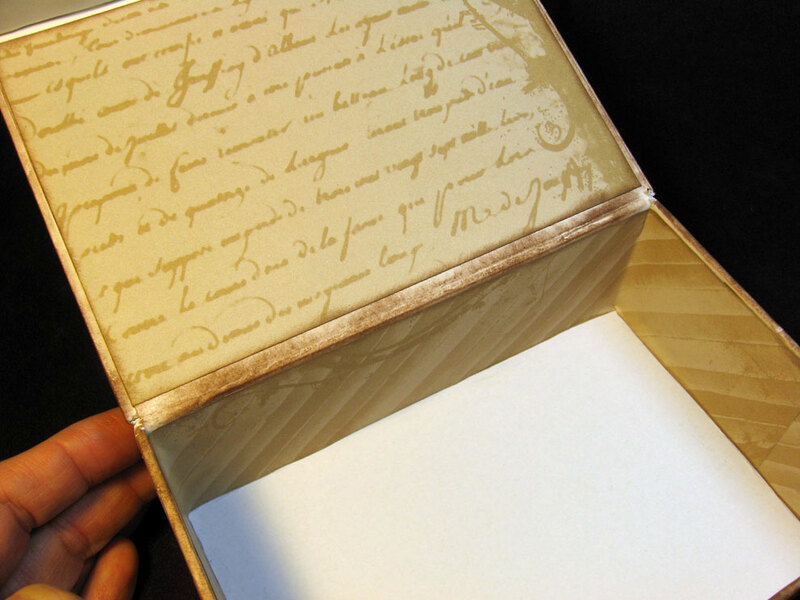 The inside of the box is lined with papers from the Notebook line. I left the bottom blank so I could insert a piece of wool felt as a liner. One of my club girls requested we do an altered mini composition book and I was happy to oblige. These are fun and fast to make, therefore a great gift idea. I try to pick up a bunch of these at my local WalMart during back-to-school time since they don't always carry them the rest of the year. 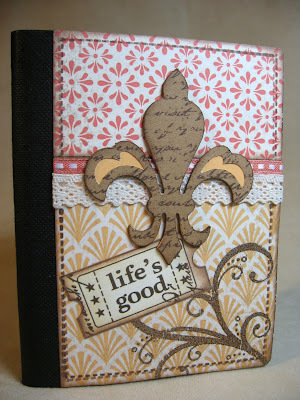 It's just a matter of covering them with papers (here I used Elemental) and embellishing them with ribbon and stamping. I don't add too much to the front since I figure these will likely go inside a purse or in the car. I used several Close To My Heart stamps for this one. The fleur de lis is from the Art Philosophy cartridge. I cut it three times, layering each one. This little tip comes from my friend DiAnn. She often does several layers like this, making her pieces look as if they are chipboard instead of paper. Nice and sturdy. Our final Cards & More project using the Elemental Paper Pack is this masculine valentine. 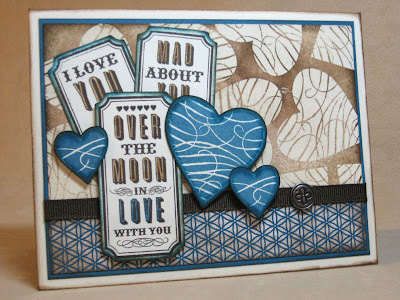 You may recognize this card from a previous post since I used it in the December Stamp of the Month "Mad About You" Blog Hop. Those stamped tags and the hearts are cuts from the Art Philosophy cartridge as well. Thanks for checking in today. I'm excitedly starting on a birdhouse project I've had in my brain for a while now. Stay tuned for that. Meanwhile have a great day! As soon as t!m's post opened, I said outloud to myself, "There's Annette's card!" Love what you did with the card box. Your blog is so totally awesome too, since you mix TM and CTMH often. I'm a huge fan of both. February Kit of the Month - "Stella"